Our Wellness Center is a state of the art healing facility. On your first visit to our wellness center you will be greeted by our warm, caring and friendly staff. A thorough health history, consultation and examination will be performed. Dr. Payne performing an infra-red scan of the spine. During the examination the Chiropractor will feel and motion palpate your spine to check for subluxations (misalignment’s of the spine). A scan of your spine will also be performed. This will be done by using an Insight Millenium Subluxation Station to record both an infra-red and Surface Electromyography (SEMG) reading. This will give a computerized evaluation to help show the area of the subluxations. Then, if necessary you will receive Digital X-rays to see the precise misalignment of the spine. The x-rays are then digitized and analyzed on the computer to record the necessary information. The information from your health history, consultation, examination and x-rays are then analyzed and a detailed report will be prepared. Dr. Payne is answering questions about the patients health concerns. The Chiropractor will go over the report of his findings with the patient. A narrative report of these findings will also be given to the patient. 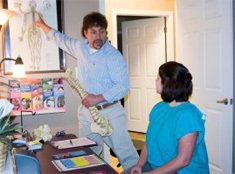 At this time the Chiropractor will give his best recommendations for chiropractic care. You will then receive a chiropractic adjustment utilizing the Gonstead technique. Regardless of your response to your initial adjustments, we hope you’ll give your body time to fully heal. Join the millions who have enjoyed relief and better health without drugs or surgery. If you think that you or a loved one is a good candidate for chiropractic care, contact Payne Chiropractic Wellness Center to arrange a thorough examination in our practice.